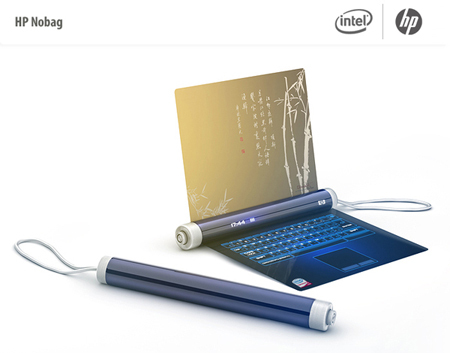 Nikita Buyanov, an industrial designer, has uncovered few outstanding concept laptops combining Intel and HP. 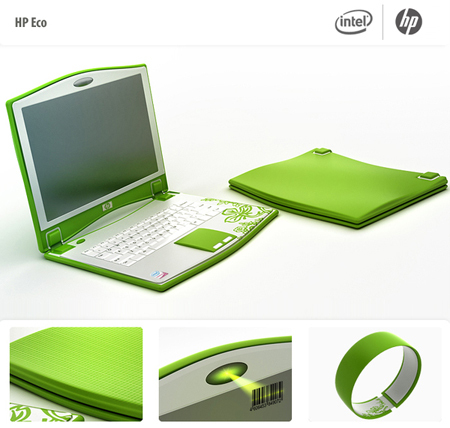 HP Eco has been designed for echo issued persons. 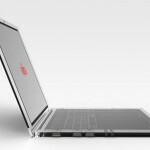 This laptop includes bar-code reader, solar charge cells and a bracelet for controlling blood pressure, pulse, and many more. 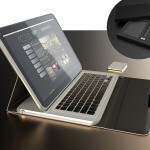 HP Nobag has touch sensor with hard OLED technology, ideal for those who don’t like to carry big bags for laptops. 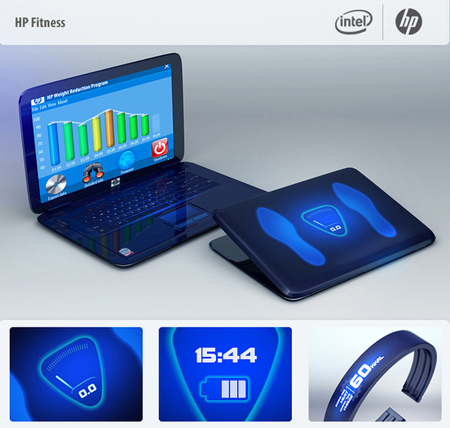 HP Fitness serves the weight control purpose most, also comprises a similar bracelet to keep record of work out sessions. HP Make-up has a button that changes the screen to a mirror and has an on-nail printing device. HP Mama will allow parents to monitor their children with two Bluetooth cameras. 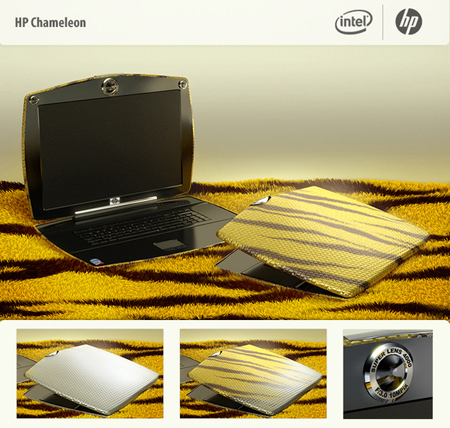 HP Chameleon is a concept laptop with an adaptive microcell coverage enabling the laptop to be transformed in its surround background. 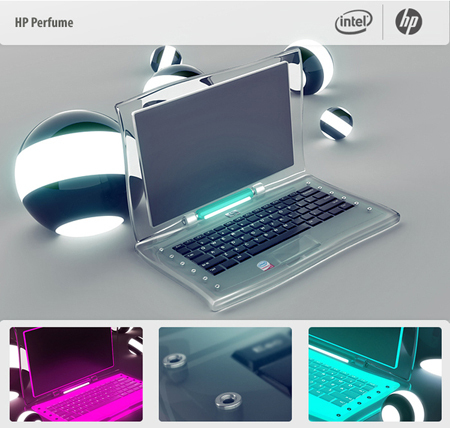 Finally, HP Perfume is conceptual laptop where you can change your laptop to a lamp or air freshener with ability to download smell samples and mix it with smell matrix of HP Perfume laptop. 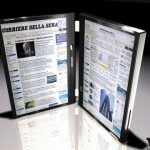 Tagged as control purpose, hp hp, oled technology, printing device, solar charge, technology ideal. 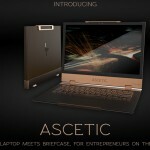 How can I find out the prices to these laptops.They are very cool. 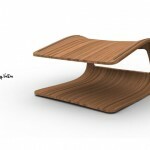 i want to know the price and its functions. and also where can i get it? 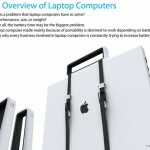 i want this nobag… i think they are awesome things. In our FUTURE! i really want to know where can i found it in malaysia… i'm interested on the nobag, chameleon , perfume and eco model… plz let me now…i need info guyzzz…. 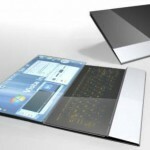 I don't think these are the official concepts approved by HP. It's simply artist's Ideas I dont think they will be available even in the future. 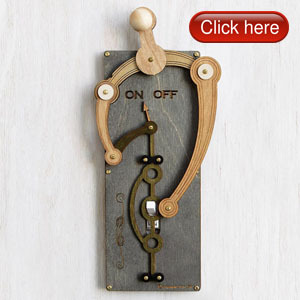 Where can I get one of this? How can I buy the pink laptap???? how can i have wholesale of nobag model ? how can i trad with you ? 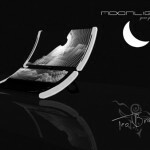 i call from mahan electronic company in iran . aeee sali kitne mein bechti hai….perfume. where can i get it ………..? I Like HP nobeg. Is that oled or amoled ? How cool!!!!!!!!! hi !!!!!!!!!!!!!! I am from mexicoo how I can buy de Make up model !!! Appealing concepts. I would like to purchase HP Nobag & HP Perfume, may I know the prices please? How can i get the HP note bag or perfume for women. Availability in stores and online. 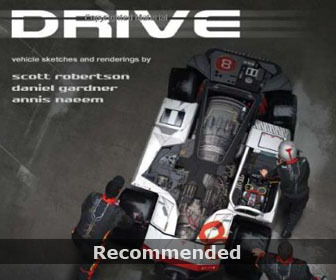 Is it on Amazon? Please let me know as i need it asap.